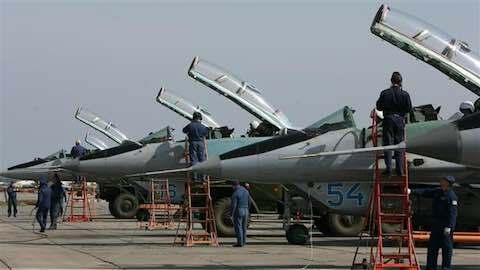 What impact is Russia's diplomatic and military intervention having in Syria? We have to wait and see, says Mark Katz. At the very least, however, Moscow's involvement should improve the Assad regime's prospects for survival, much to the annoyance of Sunnis in the Middle East and closer to home. After having surprised the world in 2014 with his annexation of Crimea and support for secessionists in eastern Ukraine, Putin has surprised the world once again in 2015 with his military intervention in the ongoing Syrian civil war as well as his stepped up diplomatic efforts (including a—yet again—surprise meeting with Syrian President Bashar Assad) to resolve it. Moscow had been backing the Assad regime against its opponents ever since opposition arose there in 2011. Up until recently, though, Moscow tended to downplay its involvement in Syria, claiming that Russian weapons shipments were being made “under existing contracts” (which were apparently open-ended) predating the rebellion. But with the Assad regime losing ground to its opponents, Moscow significantly ramped up its support for Assad since late September 2015. On October 2, 2015, The New York Times cited the Russian Defense Ministry as stating that 50 Russian aircraft and 2,000 Marines had been deployed to Syria. Russian aircraft began bombing missions against opponents of the Assad regime at the end of September 2015. One type of Russian aircraft deployed to Syria, the Su-30—is capable of engaging other aircraft in addition to ground targets. As neither ISIS nor any other Syrian opposition groups possess aircraft, many observers see the purpose of deploying these Su-30s as being to deter American and Coalition aircraft from creating a no-fly zone or flying anywhere near where Russian aircraft are operating. While the Russian military presence may grow further, Putin has indicated that he does not intend for Russian ground forces to become engaged in the Syrian conflict “for now.” On October 5, though, the chairman of the Duma’s armed forces committee, Admiral Vladimir Komoyedov, suggested that “volunteer” ground forces consisting of veterans who had fought in eastern Ukraine “cannot be stopped” from going to Syria. Other Russian officials quickly denied that Moscow was calling for volunteers to fight in Syria. Komoyedov (a member of the Communist Party) backtracked on his statement and even suggested that the Kremlin was blocking Russian volunteers from going to Syria. Whether any “volunteers” will actually arrive in Syria is not yet clear. In addition, four countries—Russia, Iran, Syria, and the U.S.-backed government in Iraq—announced that they would share intelligence regarding the Islamic State. On October 7, Russian naval vessels stationed in the southern Caspian Sea launched cruise missiles that over flew Iranian and Iraqi territory to strike targets in Syria. One Western military analyst noted that this was an unusual move since these targets could have been struck by Russian aircraft stationed in Syria which were much closer to them. This action, though, has not been completely smooth. It was widely reported that four of the Russian cruise missiles fired from the Caspian fell on Iranian territory. Further, the Iraqi government declared that it was not informed by Moscow about Russian missiles overflying Iraqi territory  (apparently their intelligence cooperation does not extend to sharing information about Russian military actions). Overall, though, Russian actions have had positive results from Moscow’s viewpoint. With Moscow’s help, Assad’s forces are no longer on the defensive vis-à-vis their opponents, and have been able to go on the offensive against them. And while probably related more to the poor design of the endeavor rather than Russia’s actions, the Obama Administration has ended its effort to train Syrian opposition forces. Further, Washington and Moscow finally signed a “deconfliction agreement” on October 19 aimed at avoiding close encounters between their aircraft over Syria. Although it is too early to tell just what practical effect Russian military activity in Syria will have, at the very least it should increase the Assad regime’s prospects for survival as well as regaining some of the territory Damascus had lost. On the diplomatic front, Putin’s moves have also had an impact favorable to Moscow. Some Western government leaders, including Angela Merkel, have joined Putin in declaring that Assad has an important role to play in the battle against ISIS, and thus should not have to step down. Even US Secretary of State Kerry has indicated that while Assad should go, he does not need to do so right away. Furthermore, Russian intervention in Syria appears to have played a part in inducing the U.S. government to drop its objections to Iran participating in the ongoing negotiations in Vienna aimed at resolving the Syrian conflict. In addition to preserving the Assad regime, Putin’s moves in Syria may be aimed at ending Russia’s isolation from the West resulting from their disagreements over Ukraine. Moscow now calls for joining with Western as well as other governments in a “united front” against ISIS. Helping Putin persuade at least some European governments to regard Putin’s actions favorably is their growing discomfort with the influx of Syrian refugees. While Western governments and publics may see Assad as unacceptable in the abstract, if working with him could help stem the flow of refugees, then many could well see Assad as the lesser of two evils compared to ISIS. Yet despite all the initial successes that Putin’s new policy toward Syria have had (and may still have), there are many challenges that Moscow faces there going forward. While the media have hyped how massive the Russian military presence in Syria has grown to, it is really fairly small—indeed, it is smaller than the current American military presence in Iraq aimed at combating ISIS. In that the small American presence in Iraq has not yet proved successful in defeating ISIS there, it is difficult to see how an even smaller Russian presence in Syria can successfully do so in Syria even if it were actually focusing its attacks on that group. Further, to the extent that Russian aid is used to target Assad’s other opponents, their external supporters will not be pleased, and may well increase aid to them. Saudi and other Arab officials have also expressed fears that the Russian actions in Syria will result in more money and volunteers going to ISIS and Al Qaeda. Opposition groups Russian forces target may well respond by attacking Russian personnel in Syria. Indeed, the 4,000 or more jihadists from the former Soviet Union that Putin has claimed are fighting in Syria might be inclined to focus their attacks on Russian personnel in particular. It should also be noted that while the flow of Syrian refugees migrating to Europe may be inducing European governments to look more favorably on Putin’s call for a negotiated settlement to the Syrian conflict which includes Assad, his internal Syrian opponents are unlikely to be moved by Europe’s plight. Additionally, while Putin may claim to be pursuing the broader goal of combating ISIS in Syria, the non-ISIS opposition is likely to see his real aim as to weaken and defeat them. This will not reduce the skepticism that they have long had about Putin’s proposals that they negotiate with Assad. And despite their rivalry with ISIS, other Syrian opposition movements continue to see Assad as their main enemy, and act accordingly. It should also be noted that mass migration from Syria does not just reduce the number of young men available to fight against the Assad regime, but also the number available to fight for it. In addition, while Western governments might be more amenable to a negotiated settlement including Assad, Saudi Arabia in particular is not likely to become so. The Saudis are focused on what they see as an existential threat from Iran. They see the Assad regime, the Baghdad regime, and Hezbollah as Iranian allies as well. Highly skeptical that the Iranian nuclear accord will lead to a reduction in Iran’s regional ambitions, they do not welcome increased Russian support for Iran’s allies in Syria. In yet another surprise move, Syrian President Assad met with Putin in Moscow on October 20. In what was his first known trip outside of Syria since the outbreak of the war there in 2011, Assad thanked Putin for Russian support, and Putin talked about the need for a political settlement. This immediately gave rise to speculation that Moscow might be ready to, eventually, nudge Assad out of office in order to achieve a negotiated solution to the conflict with part of the Syrian opposition. But while Moscow has indicated a willingness to hold early elections in Syria and even provide air support for the Western-backed Free Syrian Army (an offer this group is highly suspicious of ), Russian Foreign Minister Lavrov has also made clear that Moscow is not willing to push Assad out of power. With Moscow and Riyadh continuing to hold very different views on the future of Assad, then, reports of increased Saudi-Russian cooperation on Syria do not appear to be promising. What all this suggests is that while Russia’s increased military involvement in the Syrian conflict could delay or even prevent the Assad regime from falling, Moscow’s efforts may not be sufficient to enable the Assad regime to prevail over its opponents or reach an agreement with them. Putin’s intervention in Syria, then, threatens to become an expensive, long-term commitment that can at best result in stalemate so long as Russian forces remain there, and the downfall of the Assad regime if they are withdrawn (or perhaps even if they are not). The Western press has repeatedly observed that while the U.S. and its European allies may oppose the Russian air campaign in Syria, they appear powerless to stop it. But if, as some speculate, one of Putin’s aims in increasing Russian involvement in Syria was to distract the West from their opposition to his policies in Ukraine and actually find a basis for joint cooperation in opposing ISIS, widespread reports that Russian forces are mainly attacking non-ISIS targets are likely to prevent the achievement of that goal. But even if Western governments were willing to cooperate with Moscow in achieving a negotiated settlement between the Assad regime and some of its opponents, it is not clear that Russia, America, and Europe together could persuade major opposition groups and their regional supporters (Turkey, Saudi Arabia, Qatar) to “share power” in a regime still headed by Assad. Moscow might have a better chance of achieving this if it were able to persuade Assad to step aside, but so far, Putin has not been willing to do this. Indeed, he may not be able to if Iranian support for Assad remains strong. Putin, then, has succeeded in dramatically inserting Russian military forces into the Syrian civil war as well as engaging in a flurry of high level meetings on how to resolve. It is doubtful, though, that he can end the conflict either militarily or diplomatically—or avoid the costs and consequences of involvement in a quagmire if he can do neither. Andrew E. Kramer, “As Russia Returns to Middle East, A Look at Some of Its Weapons,” The New York Times, October 2, 2015. Andrew E. Kramer, Helene Cooper, and Ceylan Yeginsu, “Kremlin Says Russian ‘Volunteer’ Forces Will Fight in Syria,” The New York Times, October 5, 2015. “Russia Says No Ground Troops in Syria, Not Recruiting Volunteers,” Radio Free Europe/Radio Liberty, October 6, 2015. “Read: The Full Transcript of Russian President Vladimir Putin’s Speech at the United Nations General Assembly, Newsweek, September 28, 2015. See, for example, “‘More Than 90%’ of Russian Airstrikes in Syria Have Not Targeted Isis, US Says,” The Guardian, October 7, 2015. Jethro Mullen and Yousuf Basil, “Iraq Agrees to Share Intelligence with Russia, Iran and Syria,” CNN, September 28, 2015. Thomas Gibbons-Neff, “These Are the Cruise Missiles Russia Just Sent Into Syria,” Stars and Stripes, October 7, 2015. Thomas Gibbons-Neff, “Pentagon: Some Russian Cruise Missiles Crashed in Iran,” The Washington Post, October 8, 2015. Loveday Morris, “Iraq Says It Was Not Warned about Russian Missiles Crossing Its Airspace,” The Washington Post, October 9, 2015. Anne Barnard and Andrew E. Kramer, “Russian Cruise Missiles Help Syrians Go on the Offensive,” The New York Times, October 7, 2015, . Michael D. Shear, Helene Cooper, and Eric Schmitt, “Obama Administration Ends Effort to Train Syrians to Combat ISIS,” The New York Times, October 9, 2015, . “Merkel Says Assad Must Have Role in Syria Talks,” Deutsche Welle, September 24, 2015, . Carol Morello, “Kerry Says Syria’s Assad Has to Go, but U.S. Is Flexible as to When,” The Washington Post, September 19, 2015. Thomas Erdbrink, Sewell Chan, and David E. Sanger, “After a U.S. Shift, Iran Has a Seat at Talks on War in Syria,” The New York Times, October 28, 2015, . Mark N. Katz, “Who Is Putin Really Protecting Assad From?” LobeLog, September 24, 2015, . David Ignatius, “Saudi Arabia, Qatar, and Turkey Are Getting Serious about Syria—and That Should Worry Assad,” Business Insider, May 13, 2015, . Anne Barnard and Thomas Erdbrink, “ISIS Makes Gains in Syria Territory Bombed by Russia,” The New York Times, October 9, 2015, . Andrew Roth and Erin Cunningham, “In Rare Foreign Trip, Assad Flies to Moscow to Meet with Putin,” The Washington Post, October 21, 2015, . For more on Saudi-Russian relations, see Mark N. Katz, “Saudi-Russian Cooperation: To Be or Not To Be,” The Arab Weekly, August 28, 2015, . William Maclean, “Saudis Tell Russia: Syria Action Will Have ‘Dangerous Consequences’: Source,” Reuters, October 12, 2015, . Andrew Osborn and Maria Kiselyova, “Russia Says Wants Syria Elections, Ready to Help Free Syrian Army,” Reuters, October 25, 2015, . Tim Arango, “Russia Military’s Actions in Syria Cause Rift with Turkey,” The New York Times, October 6, 2015, . “Saudi Clerics Call for Jihad against Syrian Government, Russia, Iran.” The Moscow Times. October 5, 2015, . "Russian Intervention in the Syrian Civil War"